Home Styles Create-a-cart in a natural finish with a 3/4 inch oak finished wood top features solid wood construction, four cabinet doors that open to storage with three adjustable shelves inside, handy spice rack with towel bar, paper towel holder, and heavy duty locking rubber casters for easy mobility and safety. Size: 48.75w 17.75d 34.75h. Assembly required. Home Styles Create-a-cart in a cottage oak finish with a 3/4 inch oak finished wood top features solid wood construction, four cabinet doors that open to storage with three adjustable shelves inside, handy spice rack with towel bar, paper towel holder, and heavy duty locking rubber casters for easy mobility and safety. Size: 48.75w 17.75d 34.75h. Assembly required. Create-a-Cart Natural Finish with Oak Top Home Styles Create-a-cart in a natural finish with a 3/4 inch oak finished wood top features solid wood construction, four cabinet doors that open to storage with three adjustable shelves inside, handy spice rack with towel bar, paper towel holder, and heavy duty locking rubber casters for easy mobility and safety. Size: 48.75w 17.75d 34.75h. Assembly required. 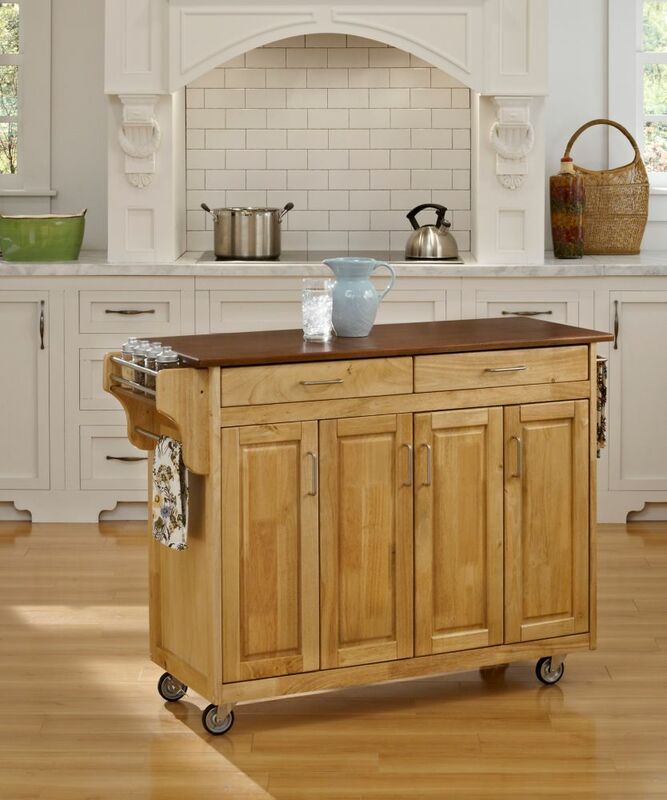 Create-a-Cart Natural Finish with Oak Top is rated 4.6 out of 5 by 5. Rated 4 out of 5 by Brandie from Came together perfectly. I was really looking forward too it... Came together perfectly. I was really looking forward too it considering the daunting process i’d face to get it. Rated 5 out of 5 by None from Pretty and practical I bought this a month ago a it's a perfect addition to my kitchen. Rated 5 out of 5 by Kimm from My experience with the website and product was excellent!... My experience with the website and product was excellent!